Tim Friebel is a part of the Intelligent CX Journeys team within Strategic Business Consulting at Genesys. 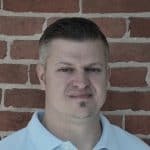 He has over 20 years of experience in enterprise software sales, integration, program and product management and marketing. He has been in a position of thought leadership in the Customer Journey Management and Analytics space since its inception over the last decade. Tim is a technologist at heart and is passionate about helping clients build impactful strategy and solutions that address CX business objectives and drive continuous value.